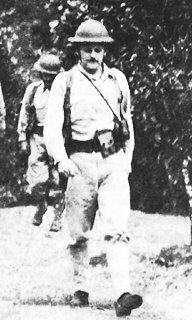 The Pacific War Online Encyclopedia: Jones, Albert M.
An expert tactician, Jones commanded 51 Philippine Division when war broke out in the Pacific. Training and equipment were incomplete, and most of the men spoke Bicolian while most of the officers spoke Tagalog. Asa a result, Jones believed only 52 Regiment was capable of effective resistance. He successfully led South Luzon Force to Bataan, but his division crumbled under Japanese attack in January 1942 and only Japanese blunders prevented a breakthrough. Jones subsequently took command of the left sector of I Corps on the west side of the peninsula, successfully directing the final stages of the Battle of the Pockets in February 1942. He took command of the entire corps during the command shuffle following MacArthur's escape to Australia and was made a prisoner of war upon the surrender of Bataan.